This privacy statement applies to http://www.egyptraveluxe.com owned and operated by Travel Luxe -Travel Service and online marketing Co. Ltd (“Egypt Traveluxe”). This privacy statement describes how Egypt Traveluxe collects and uses the personal information you provide on our Web site: www.egyptraveluxe.com. It also describes the choices available to you regarding our use of your personal information and how you can access and update this information. As is true of most Web sites, we automatically gather information about your computer such as your IP address, browser type, referring/exit pages, and operating system. In addition, we may use website analytics tools, or other technologies, like cookies and web beacons, to collect information about your visit to the Sites, including the pages you view, the links you click and other actions taken in connection with the Sites and services. We do not link this automatically collected data to other information we collect about you. Technologies such as: cookies, beacons, tags and scripts are used by China Highlights and our partners, affiliates, or analytics or service providers. These technologies are used in analyzing trends, administering the site, tracking users’ movements around the site and to gather demographic information about our user base as a whole. We may receive reports based on the use of these technologies by these companies on an individual as well as aggregated basis. We use local storage objects (LSOs) such as HTML5 and Flash to store content information and preferences [or – other uses]. Third Parties, with whom we partner to provide certain features on our site or to display advertising based upon your Web browsing activity, use LSOs such as HTML5 and Flashto collect and store information. Our Site includes links to other Web sites whose privacy practices may differ from China Highlights. If you submit personal information to any of those sites, your information is governed by their privacy statements. We encourage you to carefully read the privacy statement of any Web site you visit. The security of your personal information is important to us. When you enter sensitive information (such as credit card number) on our website (www.egyptraveluxe.com), we encrypt the transmission of that information using secure socket layer technology (SSL). If you have any questions about security on our Web site, you can contact us at Egypt Traveluxe, service@egyptraveluxes.com. Our Web site offers publicly community forums like travel stories and reviews sharing. You should be aware that any information you provide in these areas may be read, collected, and used by others who access them. You can request the removal of your personal information from our blog or community forum, by contacting us at Egypt Traveluxe, service@egyptraveluxes.com. In some cases, we may not be able to remove your personal information, in which case we will let you know if we are unable to do so and why. The profile you create on our site will be publically accessible unless otherwise indicated. You may change the privacy settings of your profile through your account. If you think that an unauthorized profile has been created about you, please contact us at service@egyptraveluxes.com.to request for removal. You can link to our site using social networking services such as Facebook, Twitter, TripAdvisor, Lonelyplanet and Wiki. These services will authenticate your identity and provide you the option to share certain personal information with us such as your sign-in information, name and email address to link between the sites. Services like Facebook & Twitter give you the option to post information about your activities on this Web site to your profile page to share with others within your network. Tell-A-Friend: If you choose to use our referral service to tell a friend about our site or send free e-cards to your friends, we will ask you for your friend’s name and email address. We will automatically send your friend a one-time email inviting him or her to visit the site. Egypt Traveluxe stores this information for the sole purpose of sending this one-time email and tracking the success of our referral program. 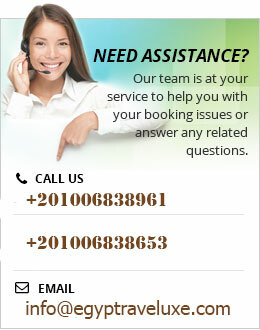 Your friend may contact us at service@egyptraveluxes.com.to request that we remove this information from our database. With your consent we may post your testimonials, questions and reviews along with your name. If you want your testimonials, questions and reviews removed please contact us at Egypt Traveluxe, service@egyptraveluxes.com. To review and update your personal information to ensure it is accurate, you may contact us directly at service@egyptraveluxes.com. We will respond to your request within a reasonable timeframe. We will retain your information for as long as your account is active or as needed to provide you services. If you wish to cancel your account or request that we no longer use your information to provide you services contact us at service@chinahighlights.com. We will retain and use your information as necessary to comply with our legal obligations, resolve disputes, and enforce our agreements. 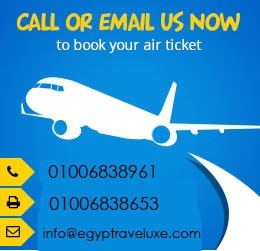 You may choose to stop receiving our newsletters by the unsubscribe instructions contained in the each newsletter that we sent, or go to our newsletter page on our website, logging into your account and updating your selections or you can contact us at Egypt traveluxe ,service@egyptraveluxes.com.